Cyndi Lauper said it best – girls just want to have fun. And when a girl becomes a woman, that means taking a breather from spouses, bosses, kids and housework. Prepare the mixed tape, make a honey-do list and set the GPS for Chattanooga. It’s road trip time. First stop, The Chattanoogan Hotel. Unpack your things and get ready for a girl’s weekend in style. The Chattanoogan has taken it to the next level with sweeping renovations in the rooms and throughout the property. Once settled, it’s crucial to set your priorities: shopping, food, wine, and chocolate. Happily, you can find all of these just a short walk away. Historic Main Street was once the financial hub of Chattanooga. Today, it’s known as the cultural center of the city, where street art is as prevalent as the old warehouses now converted into restaurants and shops. Gallery 1401 offers a beautiful collection of original fine art. Inside, you&apos;ll find works from over 30 nationally and internationally acclaimed artists in a space that also serves as a beautiful venue for events. And then there’s the HART Gallery, a non-profit that allows homeless or other non-traditional artists a chance to create and sell their artwork. You&apos;re guaranteed to find something of rare and unusual beauty to hang on your walls while helping local artists in our community. After all this do-gooding, you deserve a treat. Time to make a preliminary stop at the Hot Chocolatier to taste hot chocolate and truffles. A graduate of The French Pastry School in Chicago, Wendy Buckner now blesses her hometown with fine chocolates and pastries, creating confections that are almost too pretty to eat. Yeah, I said ALMOST. Some must-trys are the Hottie truffle – dark chocolate ganache with ancho, chipotle, and cayenne peppers – and the Orange Blossom truffle – dark and milk chocolate infused with orange flower water, fresh oranges, and a splash of extra fine orange liqueur. Last but certainly not least, Main Street offers a cornucopia of yummy restaurants. FEED Co. Table & Tavern, Hi-Fi Clyde&apos;s, and Niedlov’s Bakery are all great lunch choices. 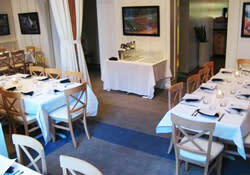 For dinner, Alleia is an Italian concept by local restaurateur and James Beard Nominee, Daniel Lindley. With sky-high ceilings, velvet curtains, foxed antique mirrors and minimalistic furnishings, you feel like you’re walking into a swank Manhattan eatery. The food, however, transports you to Tuscany…particularly the wood-fired pork shoulder with strawberry mostarda and balsamic glaze. Of course, Main Street isn’t the only place in town where shopping and food live in harmony. Warehouse Row boasts a collection of upscale boutiques for home, kids, clothes, shoes, and everything in between. You&apos;ll be ready to refine your wardrobe when you walk into Embellish, with brands such as Kate Spade, Tory Burch, Claudia Ciuti, and Rupert Sanderson. Stop by Amanda Pinson Jewelry to see unique fine and fashion jewelry. There is also a select group of nationwide stores, like J. Crew, Anthropologie and lululemon athletica that will complete your retail therapy for awhile. Whatever your fancy, shop ‘til you drop – literally – into a booth at Public House. White walls, curtains and booths greet you at this upscale Southern bistro, and the menu is as fresh as the décor. Specialties include their Southern fried chicken with macaroni and cheese and their pimento cheese, grilled sourdough and fried pickle appetizer. After all this indulging, it’s time to detox at The Chattanoogan Hotel&apos;s Spa. Designed to evoke the wonders of Chattanooga’s natural beauty, the walls are covered with artfully arranged sticks, grasses and seed pods in frames. Treatments follow this theme, such as the Rock City hot stone massage. Be sure to arrive at least 15 minutes early to soak in the whirlpool or enjoy the sauna, and make time to lounge afterwards on the Spa Terrace, where food and drinks are served. Yep…it’s true. Girls just want to have fun. But women…they just want a vacation.